St John's Place, Wedding Venue Hire! Thank you for taking the time to research St John’s Place and Church for your wedding venue and possibly wedding marriage ceremony. St John’s Place is a beautifully renovated 1860 Church set in the wonderfully rural village of Lower Bemerton in Salisbury, Wiltshire. Although St John’s Place appears to be in an out of town position, you will find it within 2 miles of Salisbury city centre, making St John’s Place an ideal location for any Salisbury wedding. This is a wedding venue like no other as religious Marriage ceremonies can still be performed within the beautifully untouched Church Chancel. Where else can you have a traditional wedding followed by your wedding reception in the same wonderful venue? 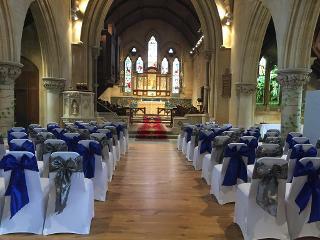 Wedding ceremonies at St John’s Place are to be booked directly through Bemerton Parish at an additional fee. Contact Keren or Simon on 01722 328031. St John’s Place will provide you and your guest with a cleverly open planned layout giving you the opportunity to enjoy the incredible old meets new feel, whilst providing the light that will transform your special day into a magical experience. We will provide you with high quality banquet tables and chairs that will enable you to seat up to 100 guests for your wedding breakfast and the adaptability of the space will ensure that up to 150 guest can enjoy a party atmosphere for your evening reception whilst continuing to breath in the amazing building of St John’s Place.